TeleLaunch is a secure radio-controlled rocket launch system capable of operating up to 792 pads from a single controler. A typical TeleLaunch system consists of one TeleLCO unit and one or more TeleFire units. TeleLaunch uses a two-way digital radio communications system for positive indication of all operations. The communications link is secured with AES CBC-MAC to prevent accidental or intentional operation from unauthorized transmitters. 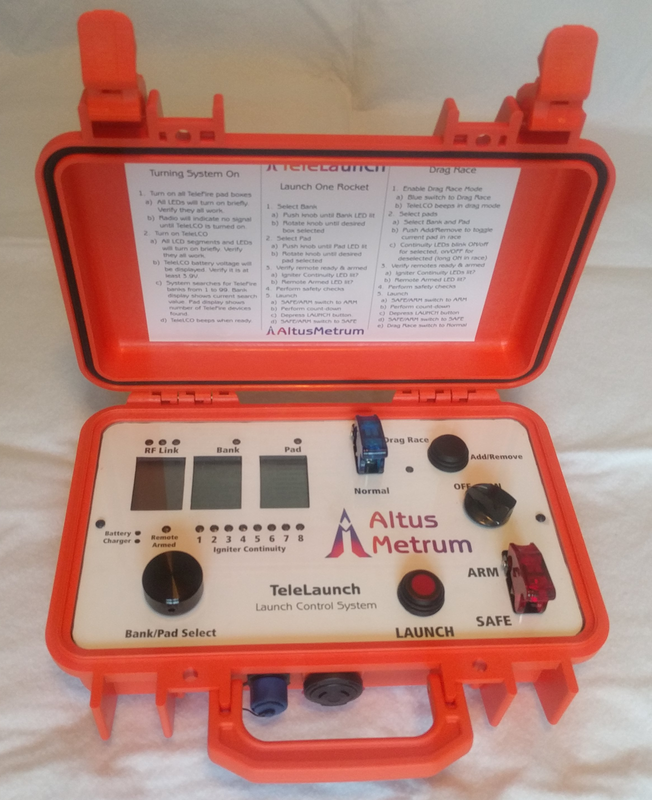 TeleLaunch operates in the 70cm amateur band at low power using Altus Metrum's proven modulation and coding schem to avoid interference with any rocketry electronics or other communication devices. 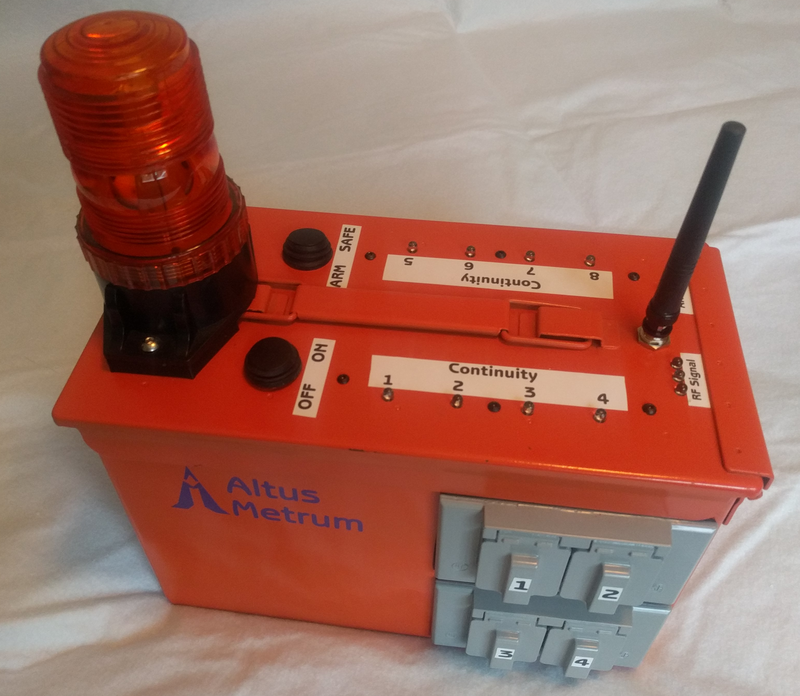 All boards in the TeleLaunch system are easily configured using USB for parameters like operating frequency, callsign, cryptographic key, and in the case of pyro units the designated bank number. All TeleLCO devices in the TeleLaunch system are designed to use a lithium polymer battery that can be recharged over USB. They support distinct arm and fire switches, continuous indication of igniter continuity, and have super-bright LED indicators for remote arming, continuity, and RF link quality plus an audible indication of arming. TeleLCO controls up to 99 TeleFire banks, comes packaged in a rugged case, and is typically placed on a table for use by the designated LCO. Drag races are supported with a separate normal/drag mode selection switch, drag mode LED, and select pushbutton. Channels that are included in the current drag race selection have blinking continuity indicators. The TeleLCO hardware design is available from git.gag.com in the project hw/telelco. Each TeleFire box in the TeleLaunch system uses FET technology for lowest possible resistance paths, allowing maximum current to be reliably delivered from the power source to the igniter leads. TeleFire boards can be powered by any 10-15V supply, typically a 12V sealed lead acid battery. Continuity Detection. Igniter continuity uses a low-current sensing system which sends only 100µA through the igniter to prevent false ignition. Super-bright LEDs for continuity, arming and RF quality indicators. Strobe and Siren. TeleFire boards have has two 12V medium current (5A) outputs to drive a siren and strobe light when the launch system is armed and ready to fire. Local arming switch. When in the safe position, power is completely disconnected from the igniter circuits to prevent any possibility of the LCO accidentally engaging firing circuits during rocket preparations at the pad. TeleFireEight has eight igniter circuits, making it ideal for use at club launches. Larger clubs or launch site setups can use multiple boards to organize the site into multiple banks with up to 8 rockets each. For ease of use and quick reconfiguration, a simple DIP switch on the board inside the ammo box is used to select any of the first 8 banks, which is more than sufficient for most club needs. If all switches are off, the bank number up to 99 configured over USB will be used instead. The above photo shows a fully packaged early production version, with integral 12 Ah sealed lead acid battery. There are another four pyro outlets on the other side of the box, making the design ideal for placing in the middle of an 8-rail bank. The TeleFireEight hardware design is available from git.gag.com in the project hw/telefireeight. There's a cheat-sheat inside the lid of TeleLCO that has proven to be completely sufficient for our prototype users to figure out and use the system. A complete manual for the TeleLaunch system is available in html and pdf formats. TeleLaunch firmware is part of the larger AltOS suite of software. For now, configuration of frequencies, callsigns, and crypto keys requires a laptop with terminal emulator and a USB cable, but we are likely to produce an easier to use configuration program eventually. TeleLCO and TeleFireEight are now in production, and available for purchase directly through the Garbee and Garbee online store.